When someone mentions Hyderabad what is the first thing that comes to mind? Biryani, of course! But for young millennials Hyderabad brings to mind the India offices of tech giants like Google and Facebook. Unlike it’s close cousin Bengaluru, Hyderabad is an uncluttered new territory for the technology industry to explore. The new city, also called Cyberabad is slowly growing into a mini Indian Silicon Valley with young professionals, upbeat restaurants, spacious nightclubs and a cosmopolitan vibe. Recently, over a weekend I visited Hyderabad for the first time. The airport is located outside the city, similar to Bangalore, thus making arrival a hassle-free experience unlike in Mumbai, where the waiting time for an Uber sometimes exceeds the flight time. The Outer Ring Road which connects the city to the airport is a stellar drive, considerably reducing the time taken to cover the long distance. Three of my close friends work at Google and live in the relatively newer neighborhood of Gacchibowli. Their apartments are plush palaces, a stark contrast to my matchbox sized one BHK in the heart of Mumbai, where I pay more rent than all three of them combined. I was surprised by the level of acceptance the neighborhood extended towards outsiders, especially north Indians. It is a common bias we carry with ourselves, whenever we travel down South, but with the advent of a professional culture and the IT boom, the outlook has become remarkably inclusive! In comparison, a metropolis like Mumbai is still quite resistant to well educated young working professionals and their lifestyle. On Saturday afternoon, I insisted on some sightseeing. My friends protested that Charminar and the Old City was too crowded, so we decided to visit the Taj Falaknuma Palace. Located atop a hill, the erstwhile palace of the Nizam of Hyderabad now converted into a luxurious property, offers a scenic view of the city. We drove to the palace from the gates in a golf-cart. The palace gardens are beautifully landscaped with marble installations. If you’re looking for a lavish yet memorable experience in Hyderabad, Taj Falaknuma would not disappoint you. Make sure to book yourself a table at their restaurant before you visit though! I was quite eager to explore what a Saturday night in Hyderabad is like. We went to the Zero Forty brewery in Jubilee Hills. It was a vibrant three-storey space, bustling with millennials, home-brewed beer and good music. Unfortunately that weekend the cops in Hyderabad decided to clamp down upon all nightclubs and shut every possible place by midnight. We headed back to the apartment and ordered in. On Sunday morning I was ready for my quintessential taste of Hyderabad – the Biryani! I had been told multiple times that Paradise was quite overrated as is the case with most chains that over brand themselves. So we went to a lesser known gem called Shah Ghouse- a basic dining hall, serving delicious biryani, at super pocket friendly rates. INR 180/- was all it took to satiate two rather large appetites. For dessert, we chose an odd-sounding joint called Pappa Roti, which turned out to be quite delightful! (Don’t judge the place by the font used for it’s branding.) They serve an unusual Malayasian bun with a variety of toppings to choose from. We ordered for the Lotus Biscuit topped bun, it was delicious! The buns are soft and crunchy with dollops of butter filling. The topping was not very sweet and just the perfect complement to our bun. Following our sumptuous lunch, we picked out a place called Autumn Leaf Café in Jubilee Hills for tea. It was barely 2 kms away, so we decided to walk through the posh neighborhood instead of booking an Uber. The hilly terrain in Hyderabad adds quite a lovely touch to the landscape of the city. We walked through palatial bungalows, rumoured to house many famous filmstars including Prabhas from the Bahubali franchise. The weather in Hyderabad was extremely pleasant making the walk quite enjoyable. My last stop in Hyderabad before I flew back to Mumbai was the Autumn Leaf Café – a beautiful, quaint place in a residential area. A spacious bungalow has been converted into a vibrant outdoor café and shop for indie textiles and curios. The place was buzzing with an eclectic mix of people. The tea we ordered was served in a rustic steel kettle, adding to the charm of the place. A great way to spend a Sunday evening, before the Monday blues kick in! 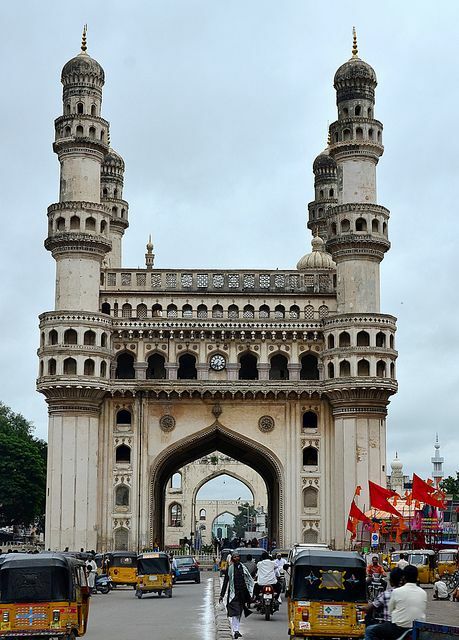 Hyderabad is a beautiful city, with good food and good fun! It is still not as mainstream as Delhi, Mumbai or Bengaluru and that is probably what makes it an easy breezy alternative to these hectic paced cities. It is becoming increasingly cosmopolitan, embracing people from various parts of the country and offering to young professionals a lifestyle they can love – swanky and affordable!